Photos by Andy, Alex B, Drew B, and Etc. It's all about positioning at the start. Gotta be first off the line. There's a quick left turn, a set of stairs, and then a broken pavement section just past the barriers. I've got this. Just breathe. This is Navy Yard/Penn Quarter. Doors opening, left side. It's been a long offseason. 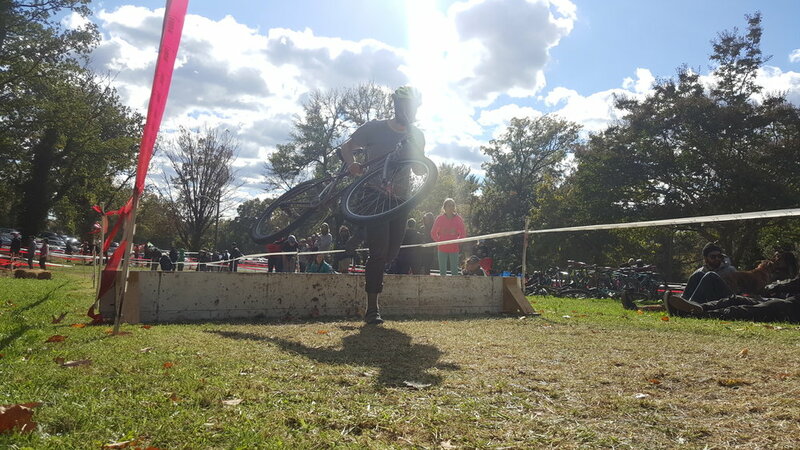 Snowbiking, bikecamping, gravel grinding, coffee grinding, daily grinding, summer slopfests, stupidity out at Colmar Manor, stupidity at Schaeffer Farm, crashes, crashes, crashes, and yes, even commuter-cross. A big chunk of Great Eskape raced the disgustingly hot Hilly Billy. There's even been cross-country moves thrown in there for yuks (for Phill and Jake) and 200 mile Dirty Kanzas for suffering's sake (for Alex M and Dylan.) Rumor has it that Phill has been turned into a cow or something (What? Phill are you ok out there in Texas? - editorial) Kevin and David did Grinduro in California and Tony grew his beard back. What the F#$k is an offseason anyway! So here we are. Back at the mud and dust. Back to handups and heckling. Back to beer, Lil' Belgians, and cowbells. do people actually ride their bikes in this sport? Great Eskape's racers are now 4 weekends and 7 races in to the mid-Atlantic (and Texas!) cyclocross season having just wrapped up DCCX. We've had at least a dozen racer's participate including 2 first time racers. The Great Eskape HQ team tent has been present bringing coffee, beer, and good vibes to two races so far and we are looking forward to seeing everyone at Tacchino CX next weekend. Until then, enjoy the above gallery of photos from the first third of the race season!